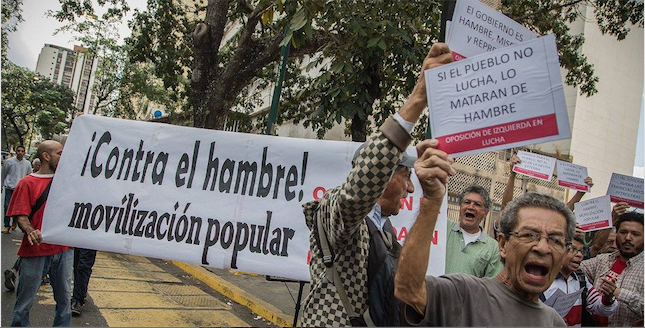 Left protest march in Venezuela. Prices double or triple monthly. The government’s decision to pay more than 80 billion dollars of foreign debt during the last four years, cutting imports by more than 80% and national production by half, has had catastrophic effects. Although the government had been insisting that inflation was the result of a political conspiracy, Maduro finally acknowledged that the double digit fiscal deficit was covered for years by simply printing up money. “We had to play like that,” he said, justifying the worst inflationary adjustment in our history. The alleged intention to eliminate the fiscal deficit was undermined by subsidies and tax exemptions for entrepreneurs. The tax exemption for oil companies alone will result in a reduction for the state of more than a billion dollars this year. Businessmen linked to the Turkish autocrat, Erdogan, be given coal mines in the north-western part of the country; the Dutch transnational Shell receives gas deposits shared with Trinidad and Tobago; massive new debt is contracted with China for at least 5 billion dollars; private oil companies get operating agreements similar to the neoliberal oil agreements of the 90s. While this package of measures was being carried out, cracks in the regime continued to open up. In the midst of great contradictions between power groups, the corporate party created by Chávez in 2007, the PSUV (Partido Socialista Unido de Venezuela or United Socialist Party of Venezuela, the ruling party) held its congress. The result was the marginalization and dismissal of the then Minister of Education, Elías Jaua. It’s the most recent in a series of splits in the Chavista leadership. Between 2014 and 2016 a group of former ministers broke with the government of Maduro, one of whom has been imprisoned since the beginning of this year, former interior minister Rodríguez Torres. Since the end of 2017, the faction of former oil minister Rafael Ramírez was purged from PDVSA (the state oil company), when corruption suits were filed against a hundred senior executives of the company. The alleged failed assassination attempt on Maduro by the use of drones of August 4, claimed by the military underground group “T-shirt soldiers”, showed the vulnerability of the government. Maduro tried to minimize the impact of the images of hundreds of members of the Bolivarian National Guard breaking formation and dispersing in the Bolivar Avenue in Caracas. The government blamed the outgoing Colombian president, Santos, while expressing his “confidence” in the Trump government, even inviting the FBI to participate in the investigation. It would not be the only recent conspiracy involving the military sector. According to information leaked to the US press, diplomats from the Trump government met with Chavista military officers who were planning a coup, although at the last moment they did not endorse the project. Several conspirators were arrested by the government. It was also leaked that Trump had proposed an invasion of Venezuela, but his military advisors dismissed the proposal. There is no imperialist consensus regarding a possible military attack against Venezuela, but this is already openly proposed by the OAS Secretary General, Luis Almagro, and by some spokesmen of the pro-Yankee opposition in exile. In this context, the National Constituent Assembly with dictatorial powers, chaired by military strongman Diosdado Cabello, prepared a draft of the new constitution, in which the presidential term is increased to 7 years and the presidential re-election is limited to a single immediate period. Maduro gave absurd objectives for the new constitution last year, such as promoting “peace”, a “new post-oil economic system”, a “multipolar world” and a “new spirituality”. [Oaklandsocialist comments: the terms “multi-polar world” and references to “spirituality” are terms used by the new fascist movement, especially as encouraged by the Putin regime.] In practice, this orientation has become imprinted into several articles that aim to strengthen the repressive legal apparatus of the dictatorship. For example, the scope of the crime of “treason to the fatherland” and the definition of “terrorism” is broadened. Strikes and mobilizations of workers have taken place since the beginning of the year, with the public health sector at the forefront. From an average of 30 daily protests in the first semester of the year, most of them defending rights such as access to public services and wage increases, this rate jumped in July to more than 70 protests per day, according to the Venezuelan Observatory of Social Conflict. This affected the government’s decision to adjust the minimum wage from one dollar a month to one dollar a day in August, which reduced the protests for a few weeks. However, the imposition of salary tables that in fact liquidate collective agreements has exacerbated the workers’ malaise, as well as the rapid evaporation of the wage increase and the persistent shortage of food. At a time when there is a total crisis of the right wing opposition parties and internal conflicts in the regime are intensifying, the reconstruction of the workers’ movement is critical. What is needed is the creation of new regional and national coordinating bodies for workers in struggle. These bodies would help unify the confrontation against the government. Some steps have already been taken in that direction. 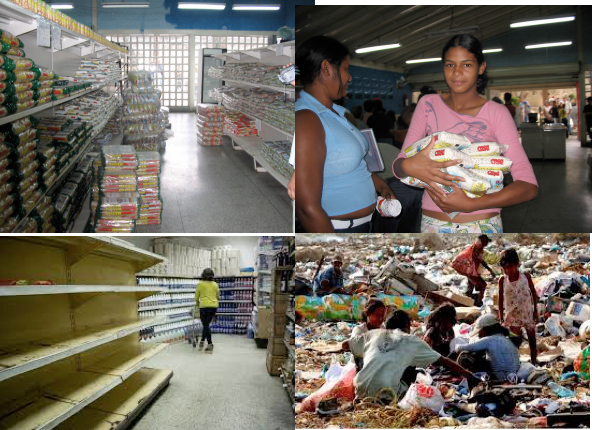 The incipient movement can put forward an alternative program like the one proposed by the Partido Socialismo y Libertad (Party of Socialism and Freedom) and other sectors of the left opposition against the adjustment and a government supine in the face of imperialist big business: to demand a minimum wage equal to the basic basket of goods and concrete measures that make such wage increase viable and real, such as the non-payment of the foreign debt, the nationalization of the oil industry, the repatriation of capital and confiscation of property and accounts of the corrupt politicians and businessmen, agrarian reform and rescuing the state metallurgical industries in the southeast of the country. Below: But when oil prices crashed, the result was economic disaster. From empty store shelves to people forced to pick through garbage dumps for food. We were in Venezuela in 2005 and took the top photos. At that time, Chavez was immensely popular. How times have changed! Oaklandsocialist comments: Trump, and US imperialism in general are using this crisis in Venezuela to attack “socialism.” Trump has also considered ordering an invasion of Venezuela as well as supporting a coup. Also, the right-wing Colombian government has also been involved in these schemes. The working class in the US and in Venezuela have absolutely nothing to gain from any involvement of US imperialism in Venezuela. While supporting the struggles of the left in Venezuela, we should oppose all imperialist involvement as well as the role of the right wing in Venezuela. We were in Venezuela back in 2005. At that time, a right wing business man replied to the fact that poverty had been reduced (at that time) in Venezuela by saying, “I don’t care about that. All I care about is my business.” That is the attitude of the right wing opposition to Maduro. For a further analysis of the Chavez/Maduro regime, see this article. We also published this article which contains a little more background to the present situation.